Community college students from two widely disparate fields of study are joining forces in an event to help combat hunger in Contra Costa County. The fifth annual Empty Bowls will take place on Friday, October 13, from 11:30 a.m. to 2:00 p.m., at Contra Costa College’s Aqua Terra Restaurant at 2600 Mission Bell Drive, San Pablo. Cost is $10 for the general public and $5 for Contra Costa College students (1st bowl only). Patrons of the event will select their own bowls, handmade by ceramics students. The bowls will be filled with soup prepared by culinary arts students. All net proceeds will go to the Bay Area Rescue Mission in Richmond to support its efforts to end hunger and food insecurity in the community. 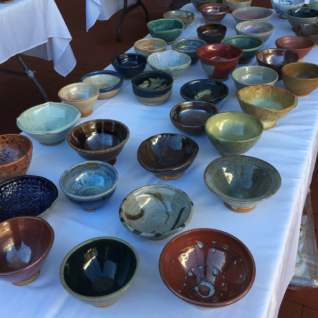 “The empty bowl that each patron takes home serves as a reminder of the many empty bowls that still exist throughout the world,” said ceramics instructor Mary Law, whose students, along with those of Culinary Arts Department Chair Nader Sharkes, are involved with the event. Empty Bowls was started in 1991 by two Michigan pottery teachers as a way to combat hunger in their community. Since then, Empty Bowls has become an international grassroots movement where thousands of potters and educators participate to raise funds and heighten hunger awareness.